The throat chakra, or fifth chakra, was the focus of one of my most recent Reiki treatments. Although, when I began treating the receiver, I did not know that specific location was in need of balancing. The location that I was focusing on was the heart. However, after a few minutes of focusing my attention on the heart, I was ready to move my hands to a different position. My intuition told me to keep my hands in the same position, but move my hands up a few inches higher, closer to the throat and neck. As I moved my hands, I could feel a stronger pull of energy through my hands; and my body felt more frozen like I needed to stay in one place…right there on the throat. At the end of the treatment, the receiver validated my intuition and hand placement. The receiver said that when my hands were moving from the heart to the throat, in their mind they were thinking, “yep, that’s where it’s at.” Further, the receiver mentioned earlier that day they met with a friend and had a deep and intense conversation. Since communication, beliefs, and values are main foundations of the throat chakra, the receiver’s throat chakra needed to be calmed and balanced. As a Reiki Master, I calm the strain of communication. This week, I’ve volunteered my time to giving Reiki to a new receiver. This week was the second time I have treated the person, and have a few more sessions scheduled for the future. This week’s treatment was arranged about two weeks ago; and I have prepared and studied different hand positions for the receiver’s dis”eases”. By preparing for this appointment, I’ve set an intent for the treatment. By setting an intent or intention for the treatment, I am focusing the Reiki energy to be beneficial for the receiver. And as I was driving to the appointment, I could already feel my hands and palms were hot. Because of the intent, my body was already channeling the Reiki energy even before I was placing my hands on the receiver. Remember to set your intentions and focus your Reiki energy to get the most out of a treatment. 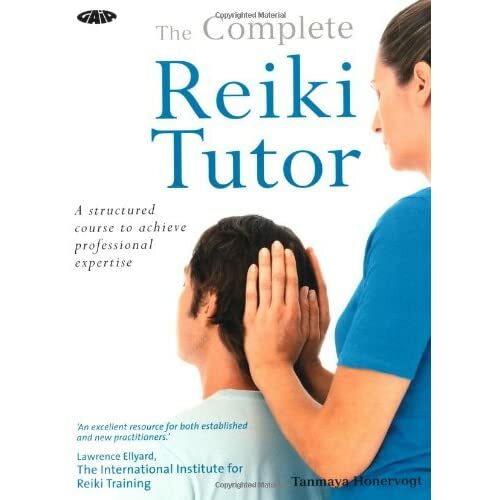 This is a great reference book for common ailments and the hand positions used for those ailments. This previous weekend, my Reiki group opened the doors and offered free Reiki to the public. Usually, a good treatment is about 20 minutes long with four practitioners surrounding a receiver. During times of slow influx of people, practitioners have a chance to receive Reiki from fellow practitioners. I was fortunate to have a chance to lay on the massage table and receive. My treatment was bittersweet, however. Bitter because a surge of public guests entered through the doors while I was receiving. And, it is etiquette that practitioners who are receiving Reiki finish their treatment quickly so that others’ waiting to receive can have a turn. But my treatment was also sweet. Sweet because even though my treatment was 10 minutes long, I felt the most relaxed and grounded I have felt in a long time and was amazed at how connected and satisfied I felt with my life. The power of Reiki de-stresses a person faster than you would ever expect. It’s great to be treated and a practitioner. Recently, I grappled with my knowledge of anatomy and physiology. I had the opportunity to treat someone who has gallstones. It took me a minute to bring the knowledge to the forefront of my brain because I haven’t treated anyone with this ailment before. As a Reiki Master and Biology graduate, I believe it is very important to know the physical locations of organs within the human body. Further, I believe I must know the main function, surrounding organs, and related organs. For this particular treatment, I knew a gallstone was a collection of cholesterol, bile, and calcium located in your gall bladder. Further, the liver and gall bladder are directly connected to each other within the digestive system. Knowing this, I was able to place my hands in the upper right quadrant of the receiver’s body for a longer portion of time during the treatment. By giving Reiki energy to this area, the gall bladder will become balanced, and hopefully break up the stones so that it can be excreted from the body.